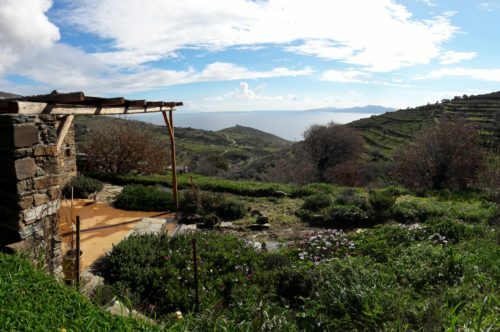 Surrounded by two private terraces, a big garden in front and a magnificent view to the sea, the big stone house is 65sqm inside and has another 150 sqm of outside area. There is also a private parking space outside the yard of the house. It has two separate bedrooms, one with a double bed and the other with two single beds. The kitchen has a bed size sofa which provides enough space for another person to sleep on comfortably. The kitchen is fully equipped with a gas oven, fridge and all necessary utensils to cook and prepare meals. There is one bathroom with shower and also some basics such as eco-soaps. The kitchen opens to a big terrace in the front of the house with a garden area, sofas and a dining table. There is also a smaller terrace on the south side which can be accessed from the bedroom. 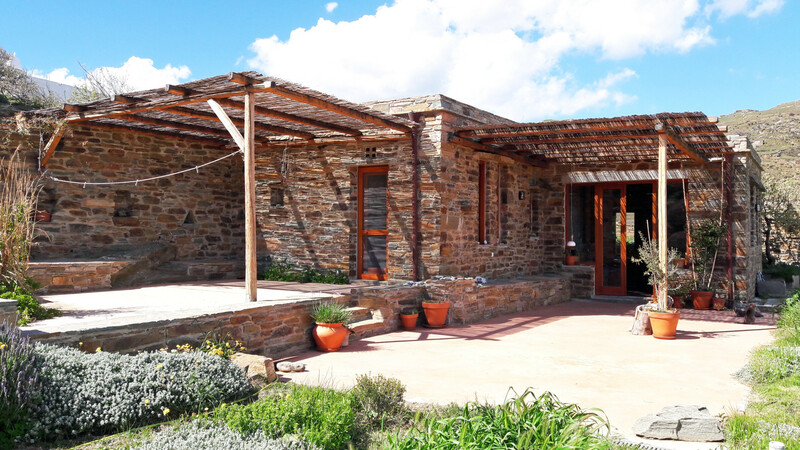 The small stone house is also surrounded by two private terraces, and has direct access to a garden with trees and a private outside sitting area under a mulberry tree. It covers 45sqm inside and the terrace and garden outside is more than 150sqm. It has a private parking space right outside the yard entrance. It has one bedroom with a double bed and a kitchen bed size sofa which is big enough for another person to sleep on or provide space for two kids. The kitchen is fully equipped with a gas oven, fridge and all the necessary utensils to cook and prepare food. There is one bathroom with shower as well as some basic essentialls such as eco-soaps. The kitchen opens to a terrace with garden sofas and dinning table. There is also another terrace in front of the house looking east giving a nice view on the see and the sunrise!